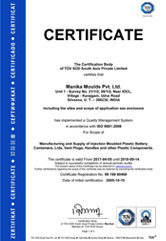 Quality Policy | Manika Moulds Pvt. Ltd.
At Manika Moulds, it’s all about DELIVERED QUALITY and IMPROVISED PERFECTION. A promise to deliver is incomplete if not impregnated with quality. A virtue stringently followed at Manika Moulds, quality control is taken seriously and categorically followed at every given stage. 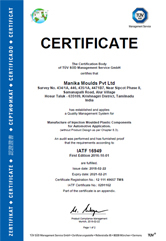 Reinforcing their promise, Manika Moulds follows stringent Quality-Check procedures and guidelines in accordance with the ISO 9001:2015 standards. 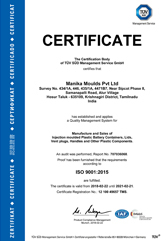 Manika Moulds is also committed to manufacturing of supply injection moulded products as per accurate needs and expectation of our customers, leaving no stone unturned in assured delivery and quality . Manika Moulds conducts complete tests within the domains of its own company. These tests include the izod impact; MFI; High-voltage; Ball-drop; Plastic yield tests etc. that ensure highest levels of accuracy and inspection. At all times, suitable equipment is utilized for accurate measurement, inspection and cautious handling of products. Taking the stiff quality control procedure a bit more seriously, Quality control and workmanship samples are provided as a biblical guide to all personnel at all levels. Once a product is ready, systematic packaging is undertaken for added protection and enhanced durability and warranty of products. This ensures foolproof production and delivery for the benefit of customers, on the Indian as well in international plethora. Trained and efficient employees with hawk eye detailing for inspection ensure advanced levels of product quality. Products are rigorously and continuously monitored through online inspection processes and are duly released only after obtaining necessary approvals. Due to continued efforts to supply customers with assured guarantee of excellence, Manika Moulds insists on conducting a pre dispatch inspection process to ensure maximum level of quality check and precision. Our employees are our greatest wealth that enables us to accelerate our performance and keep our customers on the happier side. While keeping our promise of quality on priority, we also keep the quality of employees on the apex and constantly evolve their growth with development processes and programs that enrich their mind and competence.